"For the purposes of this guide, ‘coding’ refers to computer programming, where a ‘high level’ programming language is used to instruct a computer device to perform certain functions. High level languages are similar to spoken languages but have special commands that are understood by an interpreter (coder) to enable a computer’s central processor to understand them." There's a lot of discussion on the pros and cons of learning about coding. 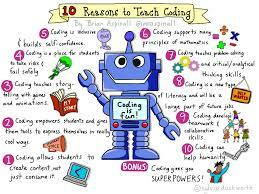 I think there are many benefits for students who engage in coding activities including deep, logical, mathematical & creative thinking; problem solving; planning and collaboration. I love the curiosity it stimulates. The "what if" and "if then" questions. What do these activities teach? The puzzles and creative activities are designed to teach students computational thinking and the basics of computer programming. Students solve each puzzle by programming visual code blocks to achieve a goal. Coding can simply be described as writing a set of instructions that a machine understands in order to complete a task. 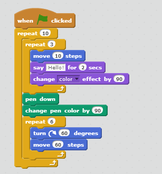 More complex programmes like Scratch use blocks of code to build programmes.